Lately we’ve taken on some client engagements that underscore an important fact: If you want to use your online presence to improve your competitive advantage, then improve SEO! In my opinion, developing a search engine optimization (SEO) strategy is one of the easiest ways today to leapfrog your competitors. Spent considerable time and budget on their branding and on their websites. Created the compelling products or services needed to compete well and are – or can be – industry leaders. Not optimized their web pages for search engines. The bad news? 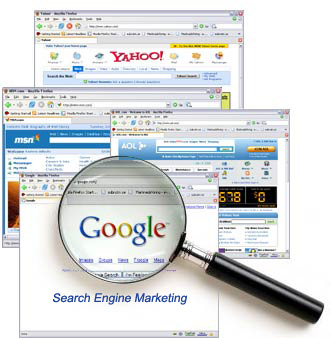 Their websites are not coming up in search engine results pages (SERPs) for many of their important keywords. The good news? Neither are their competitors’ sites!! There are a number of elements to successfully ranking high in search results. The first place to start is right on your website with on-page SEO. We’ll discuss other elements of successful SEO in later blog posts. When we work with clients to improve their SEO, we look at competitors’ sites to learn what keywords they may be using and how well they rank in search engine results for important industry search terms. We have seen time and again that within entire industry top tiers, few, if any, are optimizing. Or they’re not up to speed on the latest best practices. Here’s a quick test to see if you have an opportunity to leapfrog your main competitor using SEO. Open up your website to the home page and look at your title bar. That’s the bar all the way at the top of your web browser. If it says: Your Company Name – Home, you have SEO work to do. Now open your top competitor’s home page and see what’s at the top. If it has Their Company Name – Home, or just Home in the title bar, you have a huge opportunity to leapfrog this competitor in search results. If the competitor’s title bar begins with an industry key word or two, maybe their town or state next, and their company name last, you’ll have to implement SEO to catch up before you can play leapfrog. Even if you’ve optimized your site in the past, the rules keep changing as search engines improve their search processes – called algorithms – to improve results for users. So spiffing up your SEO is an ongoing inbound marketing activity. 20 Reasons You Should Take Control of Your Website Using HubSpot. The image is from the Flickr photostream of Danard Vincente under Creative Commons license.